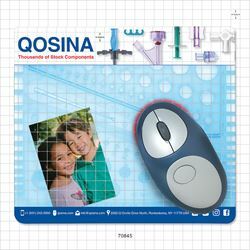 Developed and patented by Qosina's Founder and Chairman of the Board, Stuart Herskovitz, this multifunctional 9" x 8" mousepad is an ideal desktop tool for engineers. It includes several useful measurements and gauges, plus it has a textured, translucent overlay that you can lift and place notes or photographs underneath. It's slip-proof and can be used with a mechanical, optical or wireless mouse.